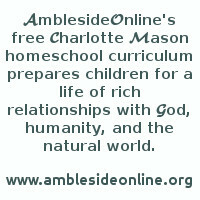 As a help for scheduling Year 8 Basic Version of AmblesideOnline's curriculum, we are pleased to offer printable charts, the weekly assignments in list form below, or families may choose to use a modification of either for their own personal use. However, please see Our Fair Use Policy before sharing any part of the curriculum. Napoleon's Buttons ch 2 Ascorbic Acid, first half OR Marvels of the Molecule Pt 1 ch 5 Left-Handed . . . The History of English Literature ch 41 Spenser - "The Shepherd's Calendar"
Napoleon's Buttons ch 4 Cellulise, second half OR Marvels of the Molecule Pt 2 ch 3 Bridges Over . . . The History of English Literature ch 42 Spenser - "The Faery Queen"
The History of English Literature ch 47 Shakespeare - "The Merchant of Venice"
The History of English Literature ch 48 Jonson - "Every Man in his Humor"
The History of English Literature ch 49 Jonson - "The Sad Shepherd"
The History of English Literature ch 50 Raleigh - "The Revenge"
The History of English Literature ch 51 Raleigh - "The History of the World"
Churchill's The New World, ch 17 Marston Moor and Naseby from 'The success of the king's campaign' to ch 18 The Axe Falls to 'but who should dragoon them?' OR Arnold-Forster ch 54. How Parliament punished the King: (2) Cromwell and the "Ironsides," (3) The Rise of the "Independents" and the "New Model"
** Chapters 11 and 12 of Napoleon's Buttons are not scheduled and should be skipped. Napoleon's Buttons ch 13 Morphine, Nicotine, and Caffeine, second third OR Marvels of the Molecule Pt 4 ch 4 Breaking Up Is . . .
Napoleon's Buttons ch 13 Morphine, Nicotine, and Caffeine, last third OR Marvels of the Molecule Pt 4 ch 5 Fidelity and . . . The History of English Literature ch 59 Bunyan - "The Pilgrim's Progress"
Napoleon's Buttons ch 17 Molecules versus Malaria, second third OR Marvels of the Molecule Pt 5 ch 6 A Snake That . . .
Napoleon's Buttons ch 17 Molecules versus Malaria, last third OR Marvels of the Molecule Pt 5 ch 7 Boxing and . . .